Cross-hatch test for sealer adhesion being performed on stamped concrete. How do I know if the sealer on my stamped concrete patio is still working, or if it's beginning to lose adhesion and needs to be stripped and replaced? There are two common ASTM field tests for determining sealer adhesion in the field, known as "tape tests." The specific application and performance criteria for these tests are described in ASTM D3359, "Standard Test Method for Testing Adhesion by Tape Test," available at ASTM International. The first of the two tests is the X-cut test and is primarily intended for use with coatings on metal substrates. The test better suited for the thin-build sealers and coatings often used on decorative concrete is the cross-hatch test. It provides the best results on coatings less than 5 mils (125 microns) thick. The test consists of a cross hatch, or "#" pattern, cut into the sealer or coating with a sharp razor blade or scalpel. A cutting guide or special cross-hatch cutter should be used if testing per ASTM specifications. For a simple field test to determine adhesion, hand cutting will suffice. After making the cross-hatch incision, apply pressure-sensitive tape or clear plastic packing tape over it and then rub over the tape until it is well adhered to the sealer or coating. Next, remove the tape and assess the results per ATSM D3359 guidelines. If the sealer is well adhered, the cross-hatch pattern should be clean with very little or no sealer removed by the tape. If the sealer is exhibiting adhesion failure, the cross-hatch cuts will have rough edges and sealer may be present on the tape. If the coating can be easily removed at the cut marks, this is another indication that the sealer is compromised and may no longer be well adhered to the substrate. What is the best and fastest way to remove sealer that's peeling away from a stained concrete surface? Use a chemical stripper. It is a messy and time-consuming process, but there is no quick and easy way to strip sealer no matter which product you use and how you go about it. Giving the stripper a long time to react and using hot water during cleanup of the sealer residue helps. See Chemical Strippers - How To Use Them Properly. 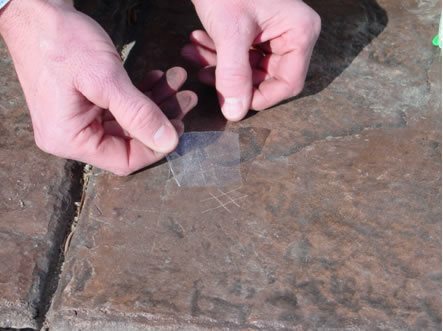 What is the best way to chemically strip sealers from concrete? The issue of stripping sealers is never at the forefront of what I write about, but in some cases it is required in order to repair or complete a specific decorative project. The first thing that needs to be clarified is what a chemical stripper is and how these strippers work. Too often I get asked which solvent I recommend for stripping a sealer. First and foremost, solvents are not strippers! A solvent may loosen a sealer or coating, but left alone after spraying, the solvent will have little to no long-term effect on the sealers commonly used in the decorative industry. Using a solvent to eliminate trapped moisture or rewet the surface is a whole different process, and is covered in other blog entries (read Blisters, Bubbles on Sealer Surface and Preventing Moisture Problems). A chemical stripper is a chemical compound that actually destroys the coating, usually turning it into sludge. Another common misconception is that an acid will remove a sealer. Most common acids (such as hydrochloric and phosphoric) will have no effect on cured acrylics, polyurethanes or epoxies. Strippers come in many forms, but they all have one thing in common. They need time to work and have to stay wet to stay active. Depending on the type and thickness of the sealer being removed, multiple stripper applications and hours of dwell time may be needed. Once strippers dry out they stop working. This is why most strippers are in gel form, because they hold better to most surfaces and they hold in moisture, allowing them to stay active longer. Today, you have a choice of environmentally friendly strippers, such as natural soy and citrus-based products, or the good old-fashioned methylene-chloride-based strippers that will take the skin off your fingers given the chance. While the environmentally friendly strippers are safer to use, they require more time to work. No matter what type of stripper you use, read and follow the manufacturer's instructions. Be sure to protect anything you don't want to strip, and be prepared for a pretty miserable job. Another method that I heard about from a contractor, tried myself, and found to be quite clever is to create a chemical stripper "cooker" using wet cotton sheets. First, soak the sheets in water and ring them out until they are damp. Apply a uniform layer of chemical stripper over the concrete surface and then cover the surface with the damp sheets. Make sure to get as much contact as you can between the sheet and the surface, pushing the sheet down into the grout lines and deep textures. Cover the damp sheets with a sheet of plastic, and seal the ends as best as possible to keep the moisture in. Let this sit for hours, and if all goes well, the active stripper will liquefy the sealer, and via osmosis, the sealer sludge will soak into the sheet, greatly reducing the cleanup required. Learn how the various types of chemical strippers work, how to choose the best one for your needs, and what safety precautions to take when using them. A new way to remove sealers and coatings from decorative concrete.